LE CASTELLET, France (AP) Lewis Hamilton capitalized on a mistake by rival Sebastian Vettel to enjoy a wire-to-wire victory at the French Grand Prix on Sunday and retake the lead in the Formula One title race. 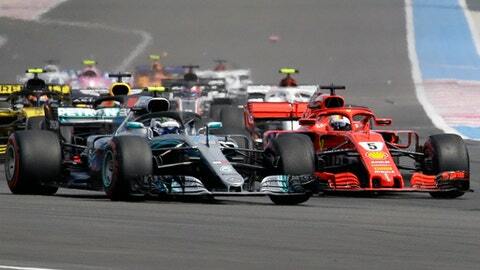 Just after the run-in between Vettel and Bottas, there was further trouble when Pierre Gasly ran his Toro Rosso into the back of Esteban Ocon’s Force India, knocking them both out of the race and bringing out the safety car. Driving conditions were optimal at the 5.8-kilometer (3.6-mile) circuit situated just inland from the Cote d’ Azur.